There are small clues, hints, bits, & pieces of this story all throughout my blog since February 2012. But here's the story in its entirety. It all started in February 2012. Dustie was on one of his treks to Israel. I was in Shreveport staying with my parents (1) so they could help with the boys, (2) because I had to be there everyday for work anyway, (3) but mostly because I'm a "scaredy cat" & don't like staying home alone. I got a phone call from Dustie. It was one of the first days of his Israel trip. We talked about his day & he told me that he had an awesome quiet time while on a boat ride on the Sea of Galilee. He said the Lord spoke to him & that he wanted me to start praying about what God told him. He said that God told him that He would be moving us from Vivian. Being in the ministry, this is not unheard of, but it still caught me off guard. I told D that I would start praying about it...so that's what we did...we prayed. After talking with the Lord for some time, He also confirmed it in my heart that we would not be in Vivian forever. We prayed, sometimes fasted, & sought the Lord in as many ways as we could. Everything He told us was about waiting on Him & trusting Him. During this time, D sought wise counsel from some of his mentors & we waited & trusted. This part of the story has been a bit long-winded, but looking back, I can see how each of those instances prepared us for, or confirmed God's message in us what God had for us. 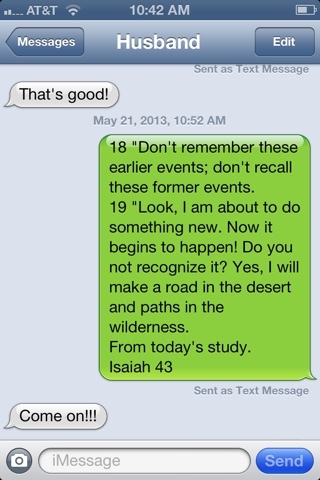 I immediately texted the verses to D. This was HUGE! This was our first message from God other than, "Trust, Wait, or have faith." God was telling us that it was finally about to happen!!! I must stop here b/c the next part gets into a new "chapter." God was not kidding. This new thing WAS about to happen, & it "did not tarry!" Here's a screen shot of mine & D's text convo on May 21, 2013.